A 40 yo female with 3 month history of left orbital proptosis. Left eye ball movement painful and restricted. 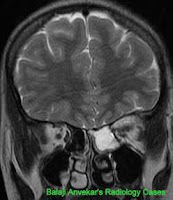 Here is his MRI Brain Coronal T2, T1w images. Sagittal T1, axial T1w images. A well demarcated lentiform shaped fluid signal intensity collection in superior quadrant of left orbit, hyperintense on T2, iso to hyperintense on T1. No destruction of adjacent orbital roof. It's strange, an Orbital subperiosteal hematoma without history of trauma. The whole study reviewed again and revealed an associated adjacent ethmoid sinus mucocele.